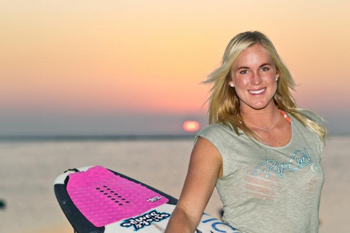 Sticky Bumps Surf Wax, a division of Wax Research Inc., is proud to announce that Bethany Hamilton renewed her contract with their Elite World Team that includes Alana Blanchard, Leila Hurst, Coco Nogales, Sebastian Williams, Dave Rastovich, Neco Padaratz, Yuri Gonçalves, Marco Giorgi and Fellipe Ximenes. Bethany, born February 8, 1990 on Kauai, HI, is known in the industry for her powerful surfing, barrel riding and passion for big-waves. “Glad to be re-signing with Sticky Bumps! Love their gear! Thankful to have great grip while surfing!” exclaimed Bethany. Wax Research celebrated its 40th Anniversary in 2012, and is recognized by the international surfing community as one of the original action sport accessory companies. It was founded in 1972 by John Dahl with the purpose of manufacturing surf and ski waxes and accessories, and continues as a family owned and operated global business today. Wax Research brands include Sticky Bumps, Ransom and WEND, and are sold by reps and distributors worldwide. Its headquarters are located in Carlsbad, California, USA.